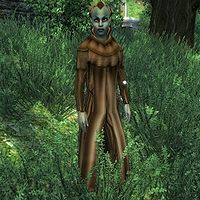 Dredena Hlavel is a Dunmer scout who is a devout worshipper of the Daedric prince Mephala, and can be found with her fellow worshippers at Mephala's Shrine. Speak with her to find out what kind of offering Mephala wants. She spends her entire life wandering around near the shrine, without ever sleeping or eating. Dredena wears monk robes and a pair of rough leather shoes. She is armed with an iron dagger and carries a small amount of gold. She knows a set of leveled rogue spells. The two other worshippers will both point you towards Dredena for further information: Ciindil will just say: "I'm not the one you want to talk to." while Rona will be a bit more specific: "I am only a supplicant. Speak to the Dark Elf wearing the robes." When you enter conversation with her, she will say, "You approach the Shrine of Mephala. The Webspinner watches you, stranger." If you select the dialog option "Shrine of Mephala," she will give you some helpful information: "Mephala tugs the strings of mortals for her pleasure. Are you sure you desire audience with the Webspinner?" If you say 'no' she will angrily send you away: "Slink away, then, bug. Stay far, far from Mephala's web." If you say you do, she will tell you how to get it: "Leave Mephala an offering of nightshade at the shrine between midnight and dawn, and the Webspinner may grant you an audience." This page was last modified on 4 January 2019, at 04:15.